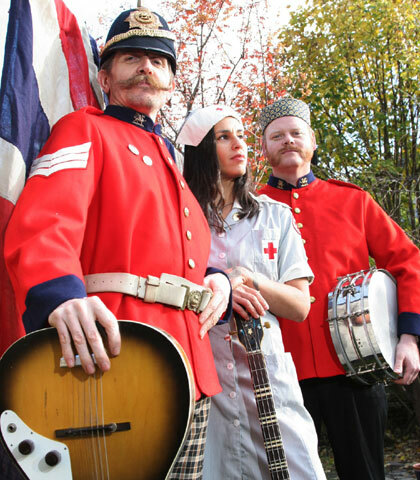 Having formed and killed off more bands than anyone else in rock history (except possibly for Mark E. Smith, but then his band’s name has always remained the same), Billy Childish is back with new outfit The Musicians Of The British Empire, which features Nurse Julie on bass and Wolf Howard on drums. Their recently released debut album, ‘Punk Rock At The British Legion Hall’ takes up where the Buff Medways left off, offering more of Billy Childish’s very own brew of radical punk spirit and raw garage-blues. Below, they pick their ten favourite films. I like black and white films with lots of shadows, I like Orson Welles, Trevor Howard and Bernard Lee, I like Austria just after the war and I like Anton Karas and his zither. I saw this film at a cinema recently and was surprised to find out that it is quite funny too. What could be better than a lazy Sunday and a three-hour epic starring a ginger-haired bum-chin in a too-short metal skirt? This film is a heartbreaker – it gets me every time. I love a film that’s about community, family, integrity and kindness. It’s the kind of a world I would like to live in. One of the greatest opening scenes. The emotion and feeling of it is amazing. I’m a huge fan of David Lean and Charles Dickens so it’s double bubble. This was been a favourite of mine since girlhood. I’d spend hours re-enacting the ‘doll on a music box’ scene in front of the mirror in my bedroom. Great songs, great story, Lionel Jeffries and of course Benny Hill, what more do you need. This is Ian Fleming’s best, better than Bond any day. I think Sherriff is one of the great screen writers. I first saw this film as a child. It is heartbreaking and still makes me cry whenever I watch it. My favourite Powell and Pressburger film with a story of deep meaning, comedy and integrity. Charles Laughton was a great actor (and a great director when given the chance); this film is full of humanity. We all like Laurel and Hardy films. This is one of the few full features they did that really works and is one of their funniest films from beginning to end. I love Julie’s first choice but that is a well know movie. Billy’s first choice is much lesser know and i was amazed to read it because I really love that movie too. It Is Just Great!!!!!!!!! Yeah, black n white and shadowy or fit to burst in vintage technicolour! why can’t films be made like these anymore?